Back to the 1970’s! 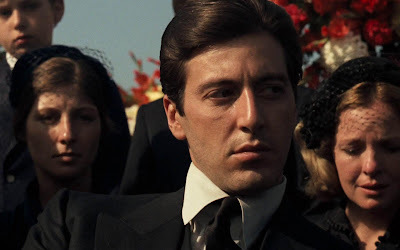 Today, I’m going to talk about The Godfather and how my view of it has changed over time. For the longest time, I wasn’t really a fan of this film. It seemed deeply flawed and dull. But I’ve since learned how to watch this movie. Interestingly, more than any other film I’ve seen except Scott Pilgrim v. The World, you need to understand how to watch this film for it to work. The characters in Goodfellas are some of the most alive and memorable on film. I can rattle off their names off the top of my head without having seen the movie in years. By comparison, the characters in Godfather are mostly dull, slow, old and forgettable. Many of them feel like they are just waiting to die. Moreover, Goodfellas is packed with really cool camera work that actually becomes part of the movie. All I need to say is “the mobster introduction scene” and most people will think of that amazing tracking shot where we follow young Henry Hill (now played by Ray Liotta) as he makes his way through the restaurant introducing all the mobsters he knows. This is an incredible piece of work as it goes on and on and you marvel at how the director could have set this up so the camera could weave its way through this tight club to let each of the characters introduce themselves. Godfather has nothing like this. In fact, Godfather is shot in such an amazingly bland and straight forward manner that it has come to feel a lot like a made-for-tv movie; it suffers that it is shot in an identical style as so many of the miniseries of the time. Indeed, not only is the camera work entirely generic, but there are no risks taken with the lighting, no risks taken with the staging, and no risks taken with the soundtrack. 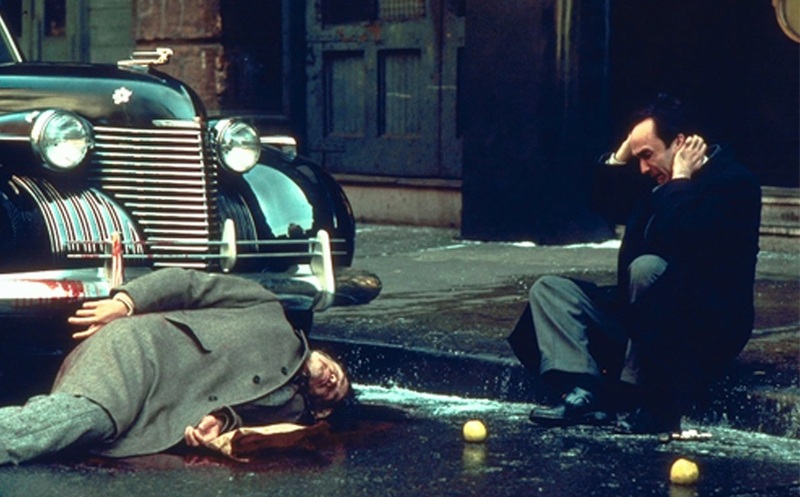 Compare that with Goodfellas which is the first film outside of musicals to truly integrate the soundtrack as a means to light up a scene and mark the passing of time, or how it uses time warps to give scenes a sense of tension (slow motion killing of Samuel L. Jackson from multiple angles) or how its characters hover in unusual places for interesting shots. Think of the bar scene where the two enemy-camps-to-be are twenty feet apart talking down the bar. Had this been done in Godfather, the characters would all be huddled together center stage. Put simply, there is nothing innovative in Godfather, but Goodfellas is innovative from start to finish. The Godfather story simultaneously feels too dense and too shallow. It is dense because it digs too deeply into too many characters, which makes the plot feel convoluted and full of filler. Yet, at the same time, the story it tells overall feels very narrow. It feels like it is only barely touching on the mafia world. Goodfellas, by comparison, has a driving plot – the life of Henry Hill, it disdains filler, and it weaves the world of the mafia perfectly into the story through the plot and the narrative. 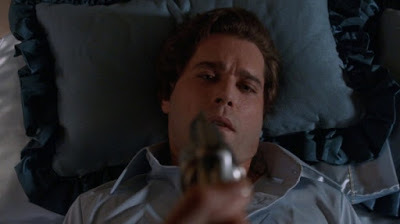 The result is that Godfather feels dull, ponderous, and unfulfilling, whereas Goodfellas feels like a wild ride that comes to a shocking conclusion. Well, no. Godfather is a decent movie. It’s not special enough that I would mention it here except that this is one of those that has a reputation which requires any film buff to see it. But it is a decent movie. The key to enjoying Godfather is knowing what to look for. 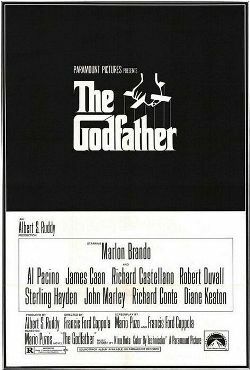 When you look at the film from the outside, it seems to be the story of the fall of Vito Corleone (Marlon Brando) mixed in with his replacement by his son Michael (Al Pacino) and how the family handles that. But that’s not a good way to see this film. If you try to understand the film in that way, it lacks focus and much of it feels like fake drama. The way to enjoy this film is to understand that it is the ironic story of Michael. Michael is presented initially as a sensitive soul who disdains the murderous ways of his family and seems like he would be the savior of his family if only he were in charge. Unlike Vito, who seems tradition bound in a modern world, Michael is modern and practical. Unlike his hothead brother Sonny (James Caan), Michael comes across as a man who would never drag the family into pointless vendettas and can rationally solve any crisis. The only knock on Michael is that no one is sure he has the strength to issue ugly orders that may need to be issued because he is such a sensitive soul. But events slowly thrust Michael into the role of head of family. Vito is nearly killed for refusing to embrace the modern world. Sonny is killed because he’s a hothead who doesn’t even know when to lay low. What’s more, the family finds itself betrayed by those who hide behind the family’s tradition of loyalty. Finally, we get Michael. He’ll save the day, right? Well, when Michael takes over, he brings an analytical approach that at first rubs the others wrong. It seems like Michael will now get the chance to modernize the family and end the vendettas. He will run the family with logic and dispassion. Only, this doesn’t seem to work. His logic comes across as weakness and it seems like Michael fails to recognize that the other mobsters are truly despicable people who will forsake their own good for the things that Michael has rejected. But logic is not static. And once Michael understand this, his dispassionate logic tells him to kill everything that stands in his way, without mercy or remorse. In so doing, he splits the family and becomes the brutal tyrant who has ruined his life by becoming everything he hates. We know he can never be happy again, nor can anyone else in the family. We also know that his actions will eventually destroy the family. If you understand the movie in this manner and watch for it, then the plot will move much more smoothly and the things that seem random or like filler in the lives of Vito and Sonny suddenly take on meaning. And ultimately, this becomes a rather interesting character study. 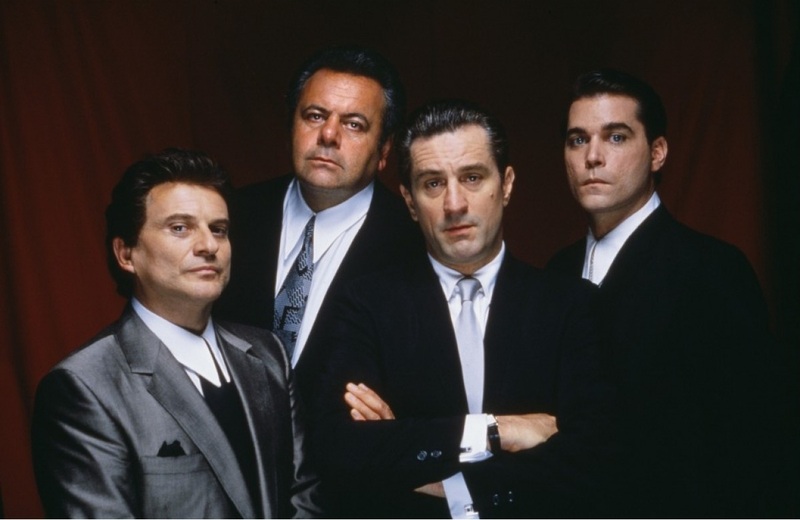 It’s still nowhere near as good as Goodfellas, but it is a decent movie that is worth seeing. Hey, wait! 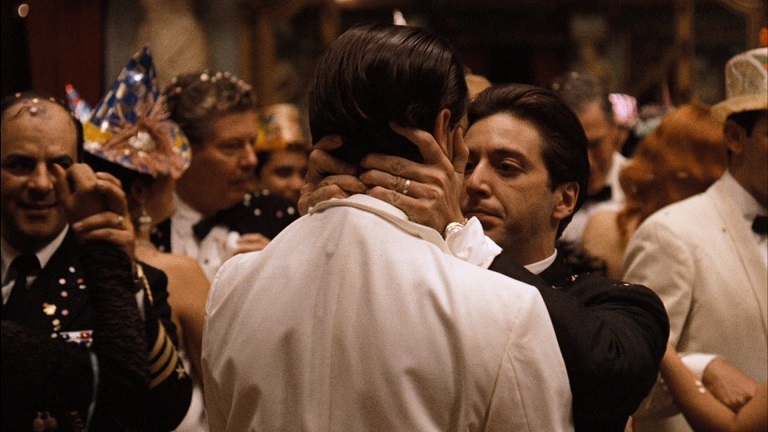 We're talking about Coppola and The Godfather, not Scorsese! So. 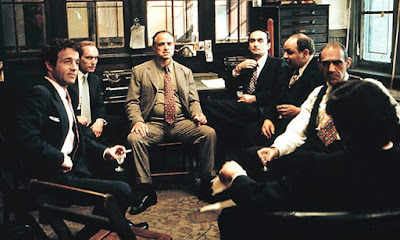 The Corleone Family Drama. My one main criticism of the film is that it's so dark. Not in its subject material, but its cinematography. I keep wanting to shout at someone "Turn on a light!" Maybe it looked brighter in a darkened theater, but I suspect not. Much has been made about its themes and metaphors about the downfall of America and the crack up of the traditional family, vis-a-vis the Corleones. From the safe distance of four decades, and looking for another political perspective, it seems to show the younger generation (Michael) inheriting the keys to the kingdom but not really knowing what to do with what their elders (Vito) built and left to them. In a way, Coppola predicted how the Baby Boomers would screw up the America that their parents bequeathed to them, although I suspect that he'd never accept that interpretation. He'd do well to look at his withering vineyard and wonder if his fellow co-generationals had made enough wise decisions. Hell, if they'd made ANY wise decisions. The movie follows its source fairly closely. There aren't any huge differences between the characters in the book or in the film. Everything about young Vito Corleone, born Vito Andolini in Sicily, that was in Part 2 is there, as is a larger role for Genco, his original consigliere. Wisely, Coppola excised Sonny's ongoing affair with Lucy the bridesmaid, and how his "endowment" left her unable to feel anything from other men (wink wink, nudge nudge), although if you see the women holding their hands farther and farther apart in the wedding scene, you probably figured out what they meant. Also banished was Johnny Fontaine's singing partner and his dowward spiral. It's just filler, and I skip those parts when I re-read the book. Also left out (although I seem to recall seeing it on at least one TV broadcast) was a little something about Jack Woltz. When Tom Hagen visits him at the studio there's a beautiful, innocent looking girl, about 12 or 13 years old, and her mother is introducing her to Woltz in the hopes that she'll become a movie star. Later, when Hagen has been thrown out of Woltz's mansion, the same young girl is there, and it's pretty obvious that she's been molested. Should that have stayed in the film? Does it put you on the Corleones' side, like when the car stopped sinking in the swamp in Psycho? Oh, I suppose one of these days I'll get out my shine box and try (again) to get through Goodfellas. 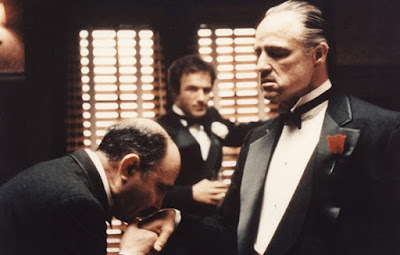 But for me, the (un)Holy Trinity of Mafia Entertainment remains The Godfather, Casino, and "The Sopranos." And for the record, the guy in the Members Only jacket killed Tony in the last scene. Just sayin'. I don't care for Raging Bull either. I agree with your interpretation of a theme being how the Baby Boomers didn't know what to do with what they've been given and then blowing it all up trying to impose their rather smug view of how they think things should be run. I haven't read the book, but I get the sense from the era that following the books more closely was the way things were done in Hollywood right around that point. That can be both good and bad. On Tony... LOL! I'm one of those who think the ending was brilliant because I think what they did was give us an entirely different perspective on Tony. For many years, we wondered why Tony often made such bad decisions. To us, the viewer it made no sense why he seemed so paranoid and irrational. But in those few minutes as we wait for something to happen, we finally understand the problem because we get increasingly paranoid and we start contemplating ideas like taking out the suspicious guy before he gets "us." ("Shoot him Tony!") That gives us amazing insight into how paranoid Tony's life really was and why he acted the way he did. I think that's brilliant. I think that also means he can't have been killed because killing him would have proved our paranoia justified and thereby lessened the lesson that we were taught about how miserably paranoid his life really was. I wouldn't call it shallow, but dense? God yes! I'd say it requires a few viewings to figure out everything, even more so with the second film where Michael's downfall is complete. From everything I've read over the years, the general consensus is that the movie improves on the novel, though I couldn't give you specifics. I do have to quibble with the camerawork comment. You bring up an interesting point: are we supposed to notice it? Many use Scorsese as an example - if you notice the Steadicam shots and the rapid push-ins, etc., is it still effective? Is it taking you out of the film if you notice it? Should camerawork call attention to itself? And yes, I prefer the second film... that final shot of Pacino sitting in the garden... what a tragedy. Scott, On the camera work, I think you are confusing two different things. 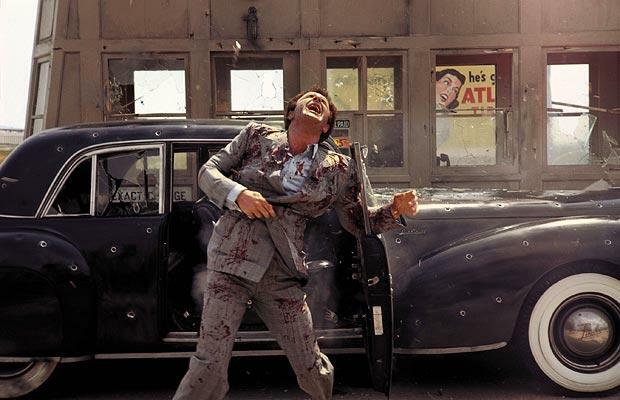 On the one hand, you have original and cool camera work like Scorsese does in Goodfellas. You aren't typical conscious of the camera itself, you just realize that what you are seeing pops off the screen and comes alive. It's original, creative, and gives the film a sense that pulls you into the film in a strong way, i.e. you feel like you are walking with Hill or you are the one pointing the gun at him. The other type, what you are talking about, are the camera tricks that film schools types like - bizarre "artsy" shots done for the sake of doing them. These tend to be highly noticeable, distracting, and not well integrated into the film. They are done to get noticed, not service the story. Andrew......I look at the Godfather series of films as the depiction of an ancient tribe on its last days. I can't remember hearing of the "Mafia" after the 80's. Did Guiliani destroy them once and for all? It looks like organized crime is now all Latin and South Americans with the Russians thrown in there for old world effect. So, The Godfather to me is a chronicle, a documentary if you will, of a past order. You should do The Deer Hunter" if you haven't already. Another period film that showed the effect of war on common Joe's. I personally like both movies but for different reasons. Goodfellas was so much in your face and I think reflects more of the kind of movies being made. Although they touch on a similar themes, I tend to think of them as entirely different movies. I have come to appreciate The Godfathers I and II over time. (I haven't ever seen III). Although Vito (Brando) is often referred to, these movies are all about Michael. There is also a lot of psychology in it. About how one in his youth rejects his father and thinks of him as an idiot or in this case a monster, but as he matures appreciates the responsibility, knowledge and wisdom. He eventually becomes him. Only an idiot would try to become the "Godfather". It is a responsibility thrust upon individuals and only a few have the talent to handle it. Unfortunately, it is a responsibility that also destroys your soul and in trying to protect the family you often lose those you love most. As for comparison, Godfather "feels" or "looks" more like the Deer Hunter than Goodfellas, which also reflects the time period it is made. I think the statement about lighting is interesting because if I remember correctly different scenes and time periods have different lighting. I don't remember the who movie being dark. The scene where Vito is with his ?grandson is very touching. He is a fun, gentle grandpa. He is happy and so is the boy...and then he dies. How are we suppose to interpret this? He has shown humanity and therefore is forgiven for his past sins? Or is he destined to never be truly happy and is punished for his sins? Bob, Actually, everything I've seen says that they all began ratting each other out in the 1980s and they kind of collapsed because of that. In some ways, The Godfather is exactly what you say. I definitely follows the general storyline of how the mob started to break down. Koshcat, For the longest time, I tried to see this as the story of the family, but it felt bloated and unfocused. It wasn't until I saw it as the story of Michael that it started to work for me. The scene with Vito is interesting, but I'm not sure how to take it. I think it's meant to be ironic: to show his dying just as he finally achieves happiness. But it also signifies the passing of the older generation. That's the last happy moment the family ever has too. First, I want to apologize, I was unaware there was a review up. I am ashamed. Second, I have not seen this movie in eons. Probably sometime when Bush was still President. Third, interesting that you compare it to a tv-miniseries. The first and second Godfather movies were edited into a mini-series, The Godfather: A Novel for Television.